Unlikely collaborations in pop music abound: Run DMC and Aerosmith? It works! U2 and Luciano Pavarotti? Why not? Robert Plant and Alison Krauss? Sure! Anyone and Kermit the Frog? Yes. They don’t always work out, but the attempts, whether kismet or trainwreck, tend to reveal a great deal about the partners’ strengths and weaknesses. Unlikely collaborations in feature film are somewhat rarer, though not for lack of wishing. I would guess the high financial stakes have something to do with this, as well as the sheer number of people required for the average production. One particularly salient example of an ostensible mismatch in animated movies---a planned co-creation by surrealist Salvador Dalí and populist Walt Disney---offers a fascinating look at how the two artists’ careers could have taken very different creative directions. The collaboration may also have fallen victim to a film industry whose economics discourage experimental duets. Inspired by a Mexican song by Armando Dominguez, Destino, on its face, seems like a very strange choice for Disney, who generally trafficked in more recognizable (and European) folk-tale sources. And yet, the exhibition pamphlet asserts, the co-production made a great deal of sense for Dalí, “if we consider that one Dalinian constant is his bringing together of the elitist artistic idea and mass culture (and vice versa) […]. 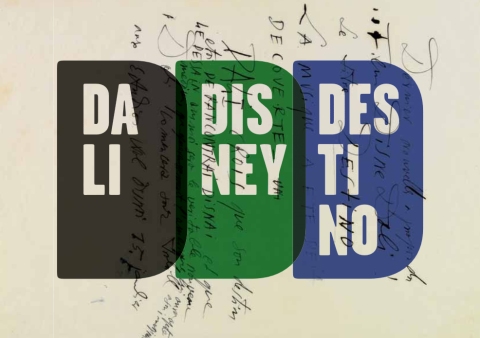 Destino becomes a unique artistic product in which Dalinian expressiveness is combined with Disney’s fantasy and sonority, making it a film in which Dalí’s images take on movement and Disney’s figures become 'Dalinised.'" This cryptic remark, writes Pallant, alludes to Disney’s plans to focus his creative energy on “safe” feature-length projects “to strengthen the company’s position within the film industry.” While such a decision might have made good business sense, it probably doomed many more Destino-like ideas that might have made the Walt Disney company a very different entity indeed. One can only imagine what the studio might have become had Disney opted to pursue experiments like this instead of taking the more profitable route. Of course, given the market pressures on the movie industry, it’s also possible the studio might not have survived at all. Captivating- so wish there had been more….